Mizoram Assembly Election Results 2018 HIGHLIGHTS: The Mizo National Front, which has been out of power for 10 years, is set to form the government in Mizoram. Mizoram Assembly Election Results 2018 HIGHLIGHTS: Returning to power after a decade, regional party Mizo National Front (MNF) on Monday secured an absolute majority by winning 26 seats, thereby ousting the Congress from its last fort in the northeast region. According to the Election Commission, Congress has won five seats while BJP has won only one seat. According to a statement released later, MNF unanimously elected their chief Zoramthanga as leader of the MNF legislature party and will meet Governor K Rajasekharan at 6 pm to stake claim to form the government. Two-time Chief Minister and Congress leader Lal Thanhwala lost both Champai South and Serchhip seats. While he lost to MNF’s TJ Lalnuntulanga in Champhai South, his loss in Serchhip to Zoram People’s Movement (ZPM)’s CM candidate Lalduhoma will probably hurt him more. This was the seat from where he won for a record seven times since 1984 barring 1998. As per the latest information on Election Commission website, MNF got 26 seats, while Congress got 5 and Independents got 8 out of 40 seats. BJP was able to get only one seat. Tawnluia was elected deputy leader of the MNF legislature party and Lalruatkima its secretary. The MNF bagged 26 seats in the 40-member state assembly. Meanwhile, Chief Minister Lal Thanhawla submitted his resignation to the governor. He lost from both Serchip and Champai South seats from where he contested. MNF chief Zoramthanga has been unanimously elected leader of MNF legislature party in the state, the party said in a statement. He will meet Mizoram Governor K Rajasekharan at 6 pm to stake claim to form the government. Counting has ended in Mizoram and latest figures show that the MNF performed a clean sweep by securing 26 seats and thereby, marking the end of Congress in the north east. The Congress has managed to secure only five seats while the BJP has won only one seat. Ruling out the possibility of a coalition government, MNF chief Zoramthanga told news agency ANI, "We will not have any coalition government either with the BJP or any other ways because my party can form the government on its own as we have got 26 out of 40 seats. We are a part of NEDA (North East Democratic Alliance) and NDA but we wouldn't like to join the Congress or UPA." 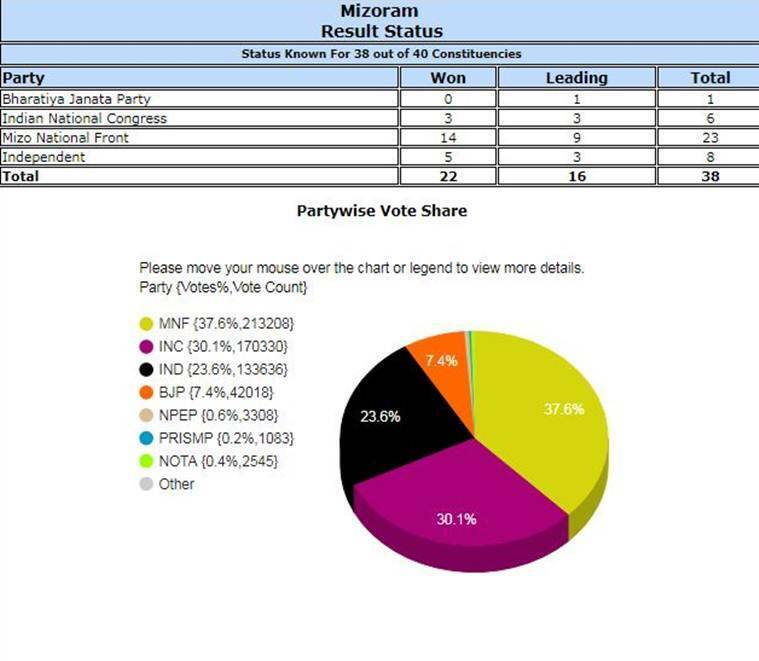 The IndianExpress.com has a LIVE data map of the results coming in from Mizoram as well as constituency-wise data. Click here to view visual data. Mizo National Front got a majority in the 40-member Mizoram Assembly as results for the 40-member Assembly elections were announced by the Election Commission on Tuesday. Mizo National Front (MNF) now ahead on 24 seats. Earlier it was leading on 29 seats. The Congress is leading on 6 seats and others are leading on nine seats. BJP leader and Rajya Sabha MP Sanjay Kakade told ANI, "I knew we would lose in Rajasthan & Chhattisgarh but MP trends have come as a surprise. I think we forgot the issue of development that Modi took up in 2014. Ram Mandir, statues & name changing became the focus." Will CM Lal Thanhwala be eighth-time lucky in Serchhip? Chief Minister Lal Thanhwala lost the Champhai South seat to Mizo National Front’s TJ Lalnuntulanga.He is also trailing behind in Serchhip — signifying the strong anti-incumbency that the veteran Congress leader faced. If he loses Serchhip, it will be historic because he has won from this seat seven times now since 1984, losing only in 1998, when his government had faced a strong wave of anti-incumbency. BD Chakma, the BJP candidate in Chakma-dominated Tuichawng constituency, is significant because the BJP has been depending on the ethnic minority community to open its electoral account in the state. A Congress legislator till October, Chakma left the party to join the BJP and contest elections. Apart from Mizos, other ethnic communities of Mizoram include the Chakmas, the Lais and the Maras, together comprising over 10% of Mizoram's population. The Chakmas follow Buddhism and has a population of almost 1 Lakh while the Lais and the Maras are Christians by faith and are considered to be a part of the Mizo society. Large sections of Mizos do not consider Chakmas a part of Mizoram, blame the community for illegal migration from Bangladesh and there have been a spate of protests by Mizo groups demanding that the Chakma Autonomous District Council (CADC) be dissolved. The lone woman minister of Congress cabinet, Vanlalawmpuii Chawngthu, is also trailing behind former Assembly Speaker Lalchamliana in Hrangturzo seat. Former Chief Minister and MNF president Zoramthanga is leading in Aizawl East-I seat against ZPM's K Sapdanga. In Serchhip, Lalduhoma, who is leading over CM Lal Thanhawla is a former IPS officer and MP. He is also the CM candidate of the Zoram People’s Movement (ZPM). ZPM is an alliance formed in October last year of seven non-Congress, non-MNF parties. The party is contesting this election eyeing the “neutral votes” — analysts say the party could be a kingmaker in case of hung results. Why is Serchhip important for Lal Thanhawala? Chief Minister Lal Thanhawala is contesting from Serchhip and Champhai South this time. As of now he is trailing in both seats. Thanhwala has won from Serchhip seven times since 1984, losing only in 1998 when his government faced a strong wave of anti-incumbency. Also in the race in Serchhip are the chiefs of Zoram People’s Movement (ZPM) Lalduhoma (also contesting from Aizawl West-I), People’s Representation for Identity and Status of Mizoram (PRISM), Vanlalruata (also contesting from Aizawl North-I), and Zoram Thar, an evangelist-political group, Zaichhawna Hlawndo (also contesting from Aizawl West-I). In Mizoram, prohibition was a major issue during the poll campaign. The Congress government had lifted total prohibition in the state and introduced a permit system to regulate alcohol consumption. The Congress argues that lifting total prohibition has boosted revenues and cut crime. In the Christian-dominated Mizo society, music plays an important role in any function, be it a religious ceremony, a political rally, a condolence meet, or a protest march. “Election favourite” artistes like Feli, Jerry Lalrinawma (who won reality singing contest Mizo Idol 2018), and Vanlalsailova are paid between Rs 10,000 to Rs 15,000 per performance. However, the BJP, the new entrant in Mizoram, has had some trouble in sourcing singers. “Many singers feel the BJP is pro-Hindu. I am not pro-Hindu but I still sing for the BJP —for me, it’s a means of livelihood,” said Melody G Fanai. Since the BJP contacted her in October, she has been travelling with the party and has sung at rallies, including those attended by BJP chief Amit Shah and Union Home Minister Rajnath Singh. The counting of votes has begun in Mizoram. The counting is being held in 13 centres in eight district headquarters. The Congress and the MNF fielded 40 candidates each while the BJP contested in 39 seats. The Zoram Peoples Movement (ZPM), an alliance formed by two political parties and four groups, also contested in 35 seats. The MNF is an ally of BJP at Centre but has decided to fight the Mizoram polls separately. Elections in the Christian-majority Mizoram are usually quiet affairs, due to certain guidelines issued by the Mizoram People’s Forum, a church-sponsored election watchdog. During the 2003 Assembly elections, Mizoram witnessed a spate of violence, including blasts. There were allegations that insurgent groups based in Manipur were attempting to sabotage the elections by threatening people to vote for candidates of their choice. It was then that the Church, which occupies a powerful socio-religious position in Mizoram, decided to step in and help rectify the state of elections. Such is the clout of the MPF that a month back the family of a candidate in Aizawl south-III constituency offered to make a donation to the local Church during campaigns. The church, according to sources, denied it, saying they do not want to get into trouble with the MPF. “The MPF works on the basis of an agreement signed by it with presidents of seven political parties, including the Congress, the Mizo National Front (MNF), the BJP, and the Zoram People’s Movement. It ensures that the Election Commission regulations are followed on the ground,” Rev Dr R Lalbikamawia, a retired pastor of Presbyterian Church and MPF general secretary told The Indian Express. The Congress and the main Opposition, the MNF, have fielded 40 candidates each, while the BJP is contesting in 39 seats for the 40-member Assembly. The Congress and the MNF have ruled Mizoram since 1987. The BJP also has set its eyes on the state this time as all other northeastern states are now ruled either by the saffron party or others supported by it. Sikkim's ruling SDF is also friendly with the BJP. 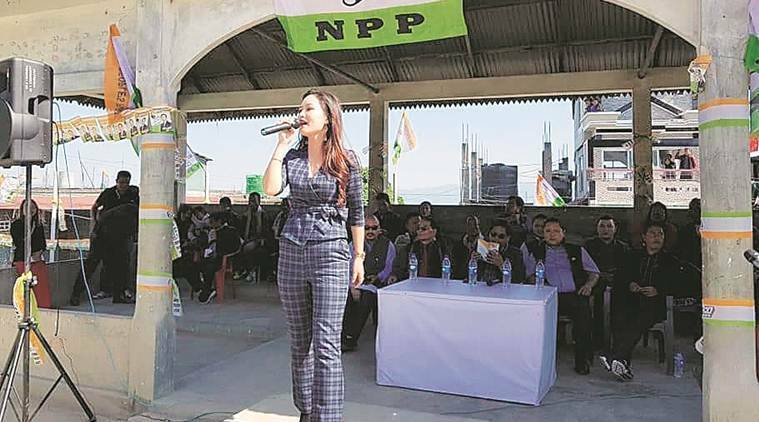 While national leaders, including Prime Minister Narendra Modi and Congress chief Rahul Gandhi, added spice to the election campaign, Mizo elections have mostly been a local affair. Before the elections, the question of whether Bru refugees would vote at polling stations set up near the relief camps or travel to Mizoram had triggered a major controversy that led to removal of former CEO S B Shashank. 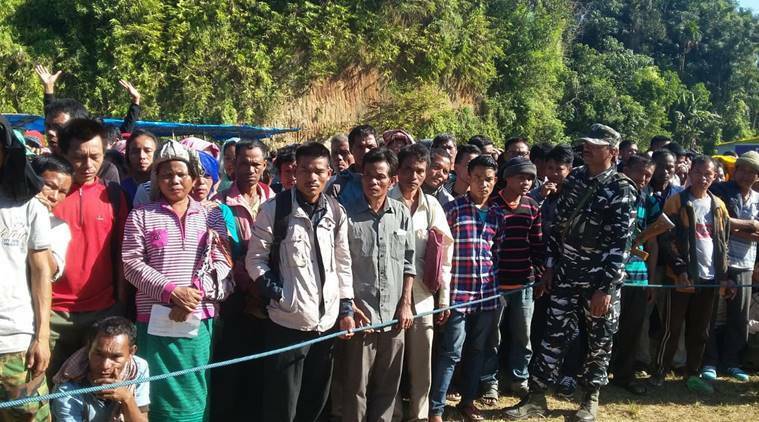 All political parties and NGOs had demanded that Brus come to Mizoram to cast their votes.